Home » Science/Tech » Wall Street Journal Facebook Page Hacked! 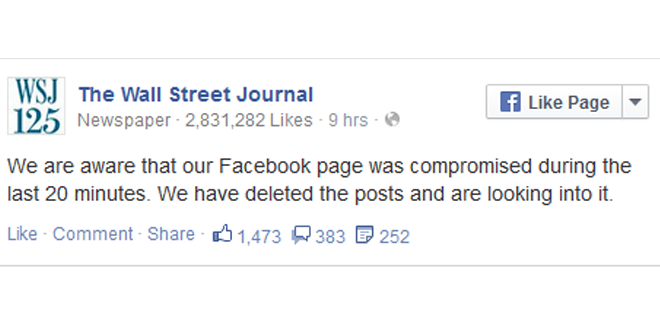 The Wall Street Journal’s Facebook page was hacked today and fake news were posted. The account was quickly secured and the fake news were removed. The fake news that was posted when the account was hacked was reports that the US Air Force One has feared to have crashed as a air traffic controllers have lost contact with the pilot over Russian air space and a little later with another post stating that Vice President Joe Biden was to address the nation in 15 minutes. Though WSJ removed the posts, uses did manage to take screenshots of it, check it out below: WSJ was quick to respond to and had them removed swiftly, they also posted a follow-up acknowledging their FB account was indeed hacked and they are looking into it. “We acted quickly to remove erroneous material and have secured the account,” a WSJ spokeswoman said later on Sunday morning. Major news agencies’ social media accounts getting hacked can turn real ugly, the last time it happened it plunged the stock market when Associated Press’ Twitter was hacked and news that bombs were placed at the White House was posted. Previous: Original Rickroll Video Removed From YouTube!